Q: Can I add bookmarks to the output flash flip book? A: Yes, with PDF to FlashBook, you can add any numbers of bookmarks for readers to read the book more conveniently. I have a PDF which got hundreds of pages, and I want to convert it into a flash flip book. But with these many pages, it must be very difficult for readers to read it, what should I do? Can I add some bookmarks or something on it? Guess what? The answer surely is YES. 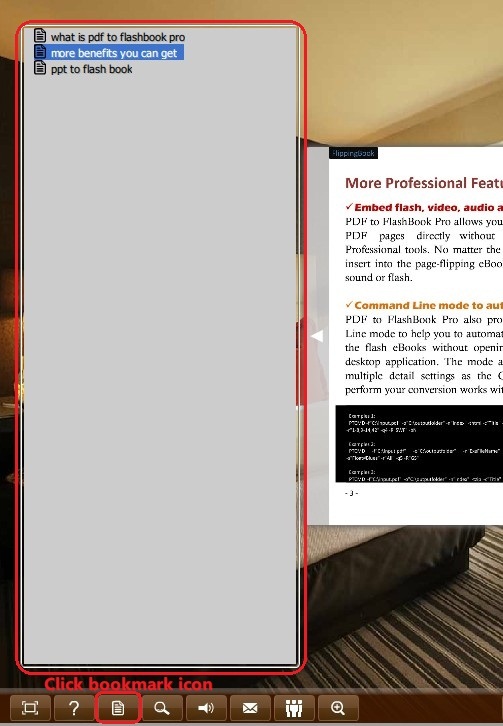 PDF to FlashBook Professional provides the bookmark feature for you, so that you can make the reading experience smoothly. Step1: Choose "bookmark" tab and you will see the operation area. then name the bookmark title at the bottom of the area. you can also highlight a bookmark and click "delete" to delete it. and click the "bookmark" icon on the tool bar, click on the bookmark title and the book will flip to tha page automatically.